NES Wally Bear and the NO! Gang (USA) in 06:23.25 by Yep2yel. Wally Bear needs to find all of his friends for a party at his uncle's house. While this sounds simple enough, it puts him in danger from dive-bombing pigeons, rabid bulldogs and anthropomorphic animals who want to get him hooked on drugs and into a gang. Worst of all: he's still got to beat his curfew! The game is designed to teach kids the dangers of doing drugs, gang banging and hanging out with the wrong crowd. Most obstacles can be avoided, but Wally can also bop enemies on the head with his skateboard. There are seven levels to traverse and two power ups to find, all while racing against the clock to help out Wally's friends. 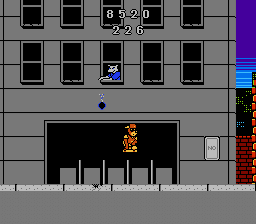 Yep2yel makes a mockery of the game's tricky platforming by bunny hopping through it and finishing in record time.